Saturday’s training focused on self arrest practice, roping up and self rescue techniques. Snow travel using ice axe and crampons was covered for non-SSI rated members. 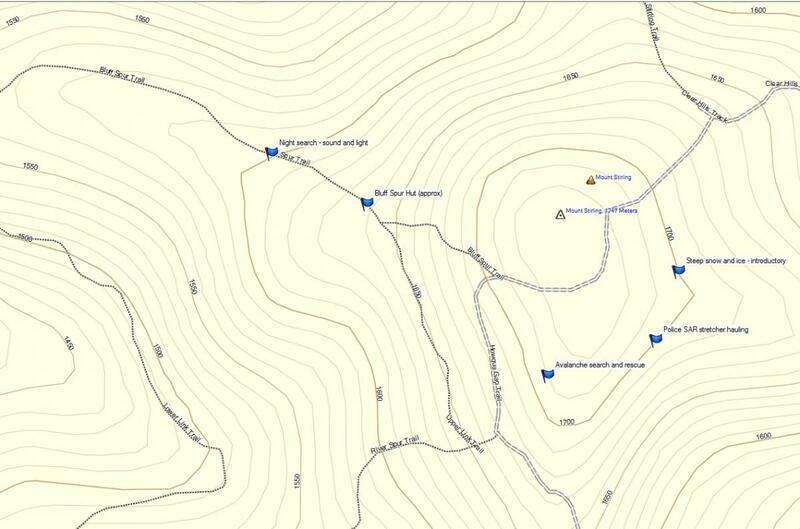 We conducted “light and sound” searching after dinner along the Bluff Spur trail in the dark. This search method requires a powerful hand torch in addition to the normal head torches we use. On Sunday, avalanche search and rescue techniques involving avalanche transceivers, probes and shovels were conducted around the summit of Mount Stirling in deteriorating weather conditions. Later on Sunday we setup then performed stretcher hauling using the Police z-pulley system and equipment the top of Stanley Bowl. This exercise was cut short due to further deterioration in weather conditions. Returning down the Bluff Spur trail was hazardous due to a large number of falling snow gums, but all members made it safely down the trail. The training organisers were Eric Krista, David Mitchell, Peter Campbell and Duncan Maughan.